As promised I am back with another product review, and this time it from one of my favourite brand's SkinCafe. You have already read my review of their lip care products. And today I am going to share the review of one of their face packs or should I say Smoothie Face Pack. 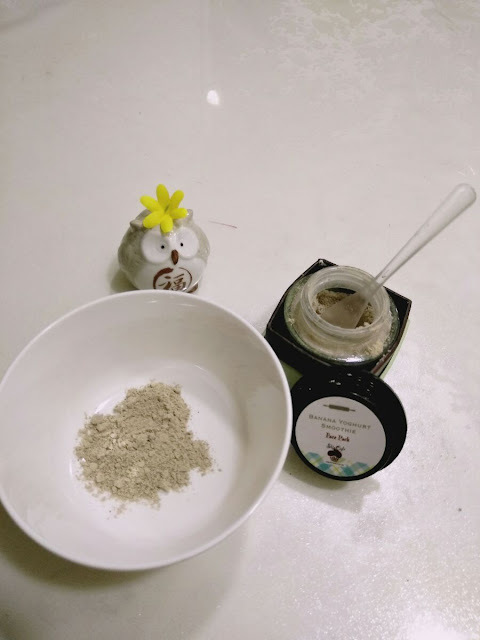 A few months ago, I had expressed my desire to SkinCafe to review one of their smoothie face packs, and they were kind enough to send me a sample piece. But before they send me the product, they asked me all about the current status of my skin and I had told them that I had a nasty tan from my long travels and my normal skin had suddenly got dry and any face mask that I tried to get rid of the tan would dry my skin even further. 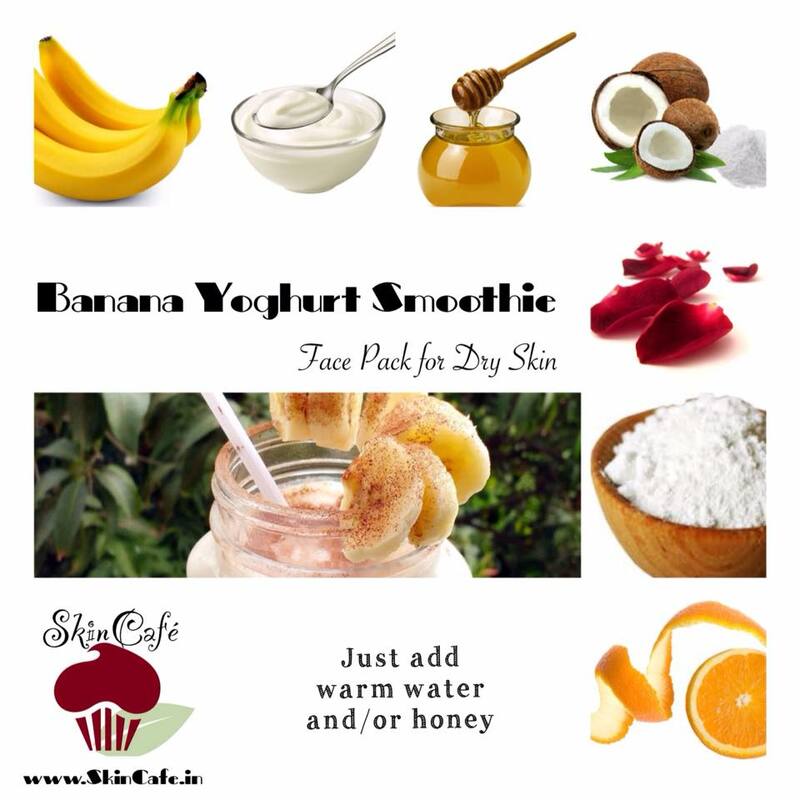 SkinCafe sent me their Banana Yogurt Smoothie Face Pack and I couldn't wait to try it. The face pack came with instructions on how to use it and as always Skincafe's clear and simple instructions always make things easier to follow. 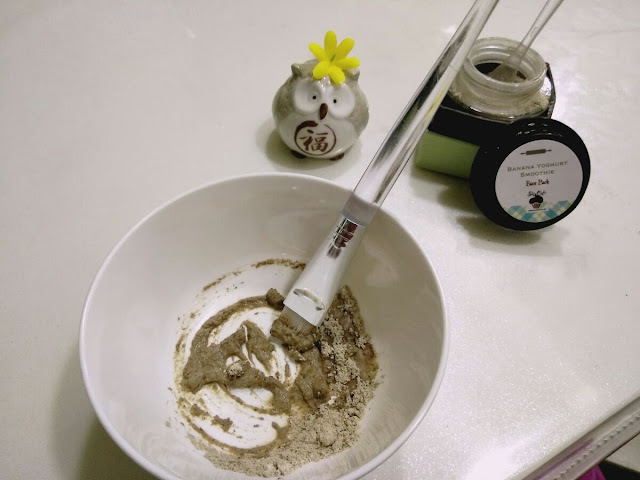 Kaolin Clay, Honey Powder, Banana, Coconut Extract, Orange Peel Powder, Rose Petal Powder and Yogurt Powder. Wash your face with hot water - this will open up the pores. Take a couple of spoonfuls of the 7 ingredient Face Smoothie Pack into a clean bowl. Add warm water and honey(optional) to make a paste. The texture should be that of a smoothie-not too thick, not too runny. Apply the pack on your face using clean fingers or a face pack brush but never with a sponge applicator as wet sponges could breed all kinds of bacteria. Now let the face air dry. Now scrub your face clean with warm water and then splash it with a bit of cold water to seal up the pores. Follow with a light moisturizer if needed. Skincafe recommends you use this Face Smoothie Pack once or twice a week. I have been using this smoothie face pack for almost a month now, twice a week. 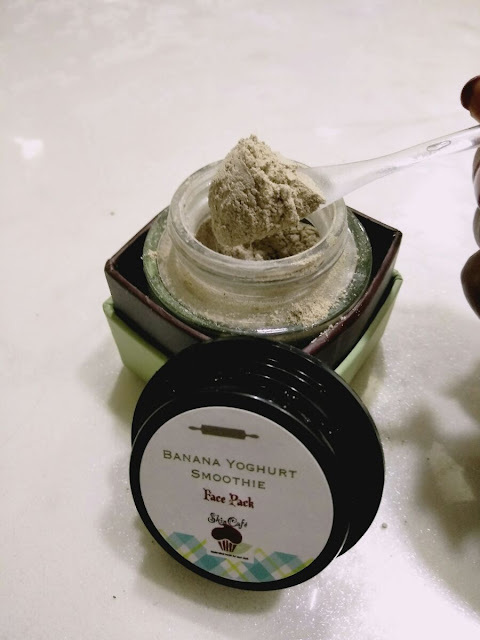 I just use two spoonfuls of the face smoothie pack which is enough for my face and neck. The first time, I tried making the face smoothie with honey and water, but I did not like the feel of honey on my face and it was a little difficult to remove the mask. So after that use, I just mixed the face smoothie pack with warm water and it made a nice smooth paste which spread evenly and easily on my face and neck. Removing the face smoothie pack was also easier. The first thing that I noticed after I washed off the face smoothie pack was that my skin did not feel dry. 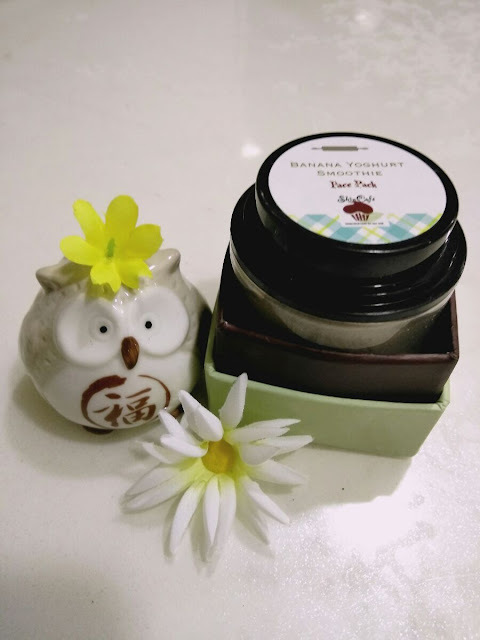 In fact it felt smooth and looked nourished which is quite unusual for my skin after I use a clay mask. The tan didn't seem to reduce much, but my face looked fresh. After repeated use in the following weeks, I could see visible reduction in the tan and my face stopped feeling dry. 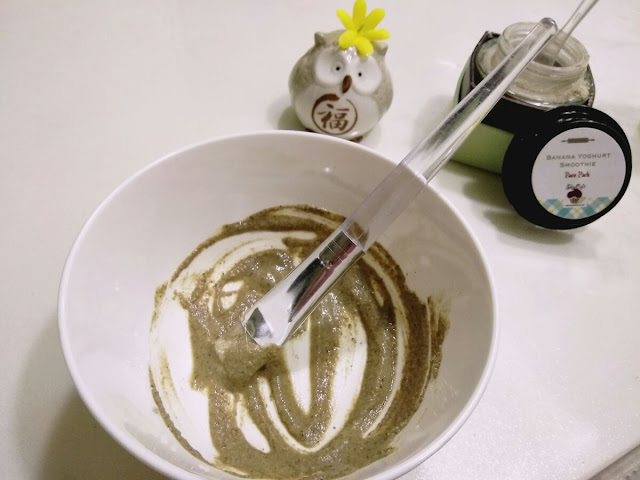 I am a fan of this smoothie face pack and the fact that Skincafe products are all made-to-order from fresh ingredients just makes them even more effective and better. I recommend trying their face smoothie face packs depending on your skin type. Awwww, the pics are so so awesome. And detailed. Love the review! Thanks so much. Hola! I've nominated you as The Versatile Blogger. Head over to my blog post to know what's next, and the rules. http://allinmoderation.ca/2017/06/lifestyle-versatile-blogger-award-seven-facts/ Happy Wednesday and congratulations!!! I'll have to look out for this product. I love that it has natural ingredients!